Flexibility is a natural ability in life. It is possible to highlight this concept as a resource in everyday situations, especially those days when our society is looking for healthy ways of living. Humans can use emotional regulation and acceptance of life circumstances as a quality to develop better relationships as well as a resource for success. This human skill is a beneficial way to be effective in the achievement of goals. It allows living our life a bit more calmly and acting on medium term goals rather than living driven by impulses. Flexibility, gives time to think about possibilities and solutions instead of being rigid and judgmental with people and situations in life. Being flexible allow people to have a holistic vision because people can listen to many options. Humans can use the potential of emotions, thoughts and behaviour to create coherence and positive thinking in life. People can resolve and face challenges in a more assertive and confident way. They use their skills of flexibility to resolve uncertain situations, create healthy relationships, while keeping a high sense of self-confidence. Psychological flexibility is complex and involves two different processes. The first one refers to experiencing situations without judgment. Most people tend to be highly judgmental of both people and situations that occur in life. This psychological skill requires us to go against our normal way of being. 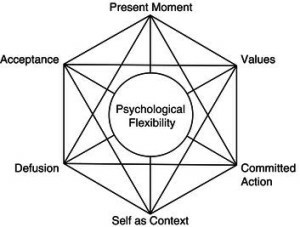 To develop flexibility we need to be “more in the moment”. The second process refers to being able to make the necessary change to cope with the demands of life. This requires the person to be aware of what change is required and the confidence to be able to execute this new behaviour. For example, a person who is very shy can practice flexibility through exposing themselves to unfamiliar social situations. In these situations they can practice expressing themselves and asking others unfamiliar questions. It is very difficult to create just one “recipe” for flexibility. However, Masuda and Tully (2012) conceptualized it as an “overarching regulation process of experiencing the present moment as it is without judgment and avoidance and persisting or changing behaviour when doing so serves valued-ends”. Accumulating evidence has shown that psychological flexibility is positively associated with psychological well-being and inversely associated with a wide range of distress, including depression, anxiety, and general psychological distress. What does flexibility mean for you? I encourage you to develop flexibility at home, in your workplace and generally in life. For you in may involve a display of affection with your children, presenting an idea at work meeting or negotiating with your partner about a problem in your relationship. This entry was posted in Brisbane News, Mental Health by mentzdog. Bookmark the permalink.